The Baran lab has now introduced a HLF variation allowing for the synthesis of a 1,3-diol from the corresponding mono-ol (DOI) illustrated here with the conversion of menthol to isopulegol hydrate. 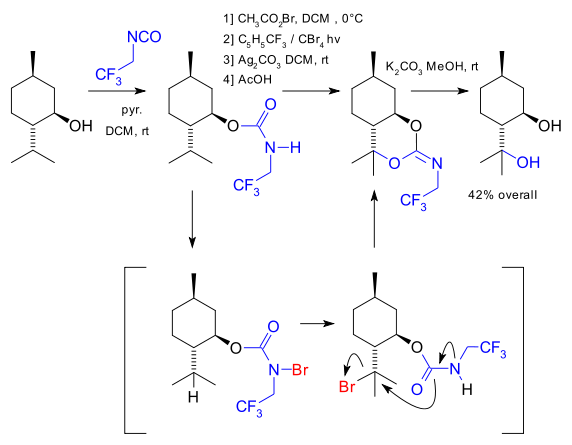 Basically what happens is carbamate formation with the isocyanate of trifluoroethylamine, bromination at nitrogen with acetylhypobromite, photochemical migration of bromine from nitrogen to tertiary carbon (requires the CF3 group), ring-closing reaction and imine formation with silver carbonate and finally hydrolysis with potassium carbonate. Be aware of a long list of limitations: the method only works with benzylic or tertiary carbon positions, other functional groups such as alkene, amine, alcohol, carboxylic acid are not permitted. The method uses stoichiometric amounts of silver carbonate and unusual solvents trifluorotoluene and tetrabromomethane. Atom economy is poor as the oxygen donor is a heavy trifluoromethyl functionalized isocyanate.